Saturday 30th of September saw Derry's Dunlgoe bar play host to a day of anarchist talks, films and music hosted by the Workers Solidarity Movement. 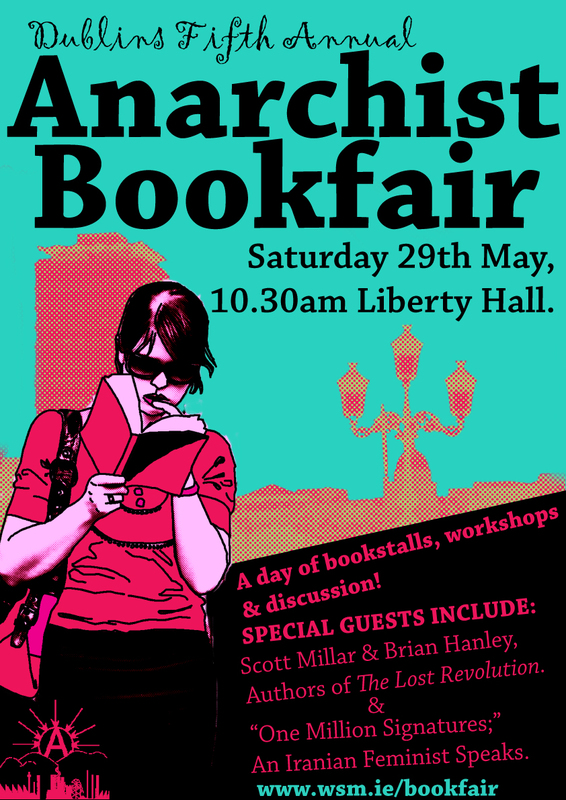 The event which was organised by a local Derry WSM member saw people from Dublin, Switzerland, Copenhagen and Belfast as well as locals gather to discuss anarchist ideas. At this point in time it is a rare and welcome event when a book by an Irish activist is published and rarer still when a book by an Irish anti-capitalist writer receives widespread praise and acclaim. Clandestines: the Pirate journals of an Irish Exile, which has received a slew of positive reviews following it?s publication in the US by AK Press, is just such a rarity, and as it is being launched in Ireland this week means readers here will soon be able to make their own appraisal of the book. On 17th of October Residents Against Racism are holding a public meeting to discuss and plan a way to campaign against the forthcoming racist immigration bill. Anarchist Reading Group Explores Theory, Movement and Practice. In the first of what will hopefully become a fortnightly anarchist reading group, we have decided to look at three short texts exploring the relationship between activism and theory. A discussion of the interaction between radical theory and movement practice seems like a rather obvious starting point to kickstart an anarchist reading group. All of the chosen articles are available free online and are short and snappy. The longest is a transcription of a round table discussion that flits and darts in conversational style over areas our own discussion might cover. Ramor will be reading from the chapter on the funeral of the Gibraltar 3 in Belfast. There is to be a national day of action in solidarity with Rossport Friday 20 october which includes a mobilisation for Rossport itself. introduction of reactionary labour laws, France has been in flames. Anti-War Ireland, in which WSM members in Dublin and Cork are participating, are holding a series of talks and demonstrations over the next week. There are three all former US army interrogators at Abu Ghraib and members now of Iraq Veterans Against the War, Joshua Casteel, Stephen Lewis and Tony Lagouranis who willing be speaking around the country over the coming week. Friday November 3rd from 8pm on..
WSM monthly social and the launch of "Red & Black Revolution" issue 11. A night of Anarchist socialising with free food and live trad music in..
WSM social in Dublin Friday 3rd Nov.